Our Glasgow clubs are not just places to feel the burn, however, but a friendly, welcoming place to relax with friends and family. Aside from welcoming staff, comfortable facilities and friendly atmosphere, we also have café, bar and lounge areas, as well as family-friendly facilities, classes and workshops. 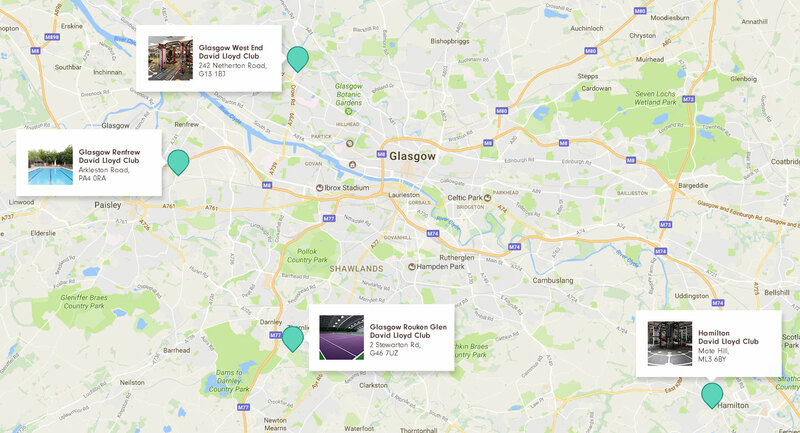 Wherever you live in Glasgow, we’ve got you covered. Explore our clubs to find out which one is perfect for you and your family. At David Lloyd Glasgow Renfrew we offer a range of gym and club facilities for you to enjoy. At David Lloyd Glasgow Rouken Glen we offer a range of gym and club facilities for you to enjoy. At David Lloyd Glasgow West End we pride ourselves on offering great gym and club facilities. At David Lloyd Hamilton we offer a range of gym and club facilities for you to enjoy.